← If there was a list, would you join it? One of the things I love about flight simulator is how multi-faceted it is as an experience. Some use it for brushing up on real-world techniques, some for flying planes they’d never have a chance to even see, much less pilot, in “real life”, and some just enjoy exploring. Today, I thought we’d look at the virtual tourism aspect of FS, with an eye toward the city and region that will draw the world’s attention starting tonight. A few weeks ago, the devastating earthquake in Haiti drew the world’s focus. I noticed that even flight simmers weren’t immune to it, with chatter about flying into Port-au-Prince for virtual relief flights picking up on the forums. At first I was a little repulsed, as if we were somehow making light of human misery for our own entertainment. Then I had second thoughts. It’s only natural for us to wonder about the world around us, but there’s so much information bombarding us every day that it’s hard to pull one single location from the mix to focus on until either tragedy strikes or some world-wide event draws our eye. Fortunately, tonight we all get to come together for a celebratory moment and turn our collective gaze on the city of Vancouver, Canada, and the start of the 2010 Winter Olympics. What better time to do a little virtual tourism? Fortunately for FS9 and FSX users, you’ve got some great options for spicing up your British Columbia scenery and going exploring. W hile the 2010 Olympic games will be spread out among many locales, the crown jewel will be the host city itself: beautiful Vancouver. Even though I’ve lived in the Northwest for a dozen years, I’m embarrassed to admit that I’ve only visited this city once in real-life, and it just so happened that I was delirious with the flu at the time. As a result, my memory of the place is a little hazy. What I do recall was a large and sophisticated city, perched smack-dab in some of the most beautiful terrain ever put on this Earth. Sim fliers have had a beautiful rendition of the city available to them for some time, in the guise of FSAddon’s Vancouver + scenery, by Jon Patch and Holger Sandmann. For your money, you get not only a detailed rendition of downtown Vancouver, with its attendant float-plane facilities (including a floating fuel station in the harbor! ), but also a host of other small airfields. My favorite, and one that Jon lavished detail upon, was Pitt Meadows. He got the look of those rusty hangars and the funky airport architecture just right. The scenery spreads out significantly past the city center, and incorporates some areas that you’ll likely hear quite a bit about in the coming days, including the ski resort at Whistler. Holger did some incredible work here, meticulously drawing in the ski runs that snake down the sides of the mountain. Very, very cool. I must admit that the first time I tried Vancouver+, which was just after its release, my computer struggled to maintain frame rates. There’s so much packed into this scenery, that it brought my humble rig nearly to its knees. Jon told me that others were able to run it just fine, so it must have been something hinky with my system at the time. Having said that, I tried it again last night, and discovered that my performance was silky smooth. Like butter. Glass. (insert smooth metaphor here) Time and technology marches on, and that’s a good thing for us ‘simmers. If you ever tried Van+ and were put off, give it another shot. You might be pleasantly surprised at what you find. If you’re interested but not sure, check out Larry Mudge’s excllent review on Screenshot Artist. I neglected to mention this when I first made this post, but Jon Patch is working with the ORBX FTX team to ensure compatibility between Vancouver+ and the upcoming FTX NA Blue (Pacific Northwest) scenery. That means no worries about purchasing – once we get NA Blue out the door, Holger and Jon will make sure V+ plays nicely with it. And oh, what a fantastic addition to the region this FTX scenery is! I can’t believe I forgot to mention it in this article. Rest assured, it’ll be worth many posts of its own once released. There’s another city in B.C. that draws a lot of tourism, and for good reason. Situated across the Strait of Georgia lies Vancouver Island (and no, just to be confusing, Vancouver is NOT on Vancouver Island). At the southern tip of the island is the capital of B.C., Victoria. If you want to expand your day-tripping to explore the capital, all you need to do is download the free Victoria +, by Don Grovestine, Jon Patch, and Holger Sandmann. Just like Vancouver, Victoria+ is rich in detail, with multiple small airfields in addition to the main CYYJ. Also included are the San Juan islands, with their many land and sea-based airports. It’s hard to believe an add-on this detailed and expansive is gratis, but there you go. Sometimes, in FS, there really is a free lunch. Download info here. Although it’s not specific to the Vancouver area, I’d be remiss if I didn’t mention the value of some good high-resolution terrain mesh for enjoying the Canadian experience. This part of B.C. is rippled with mountains and valleys, some seriously undulating terrain. Nothing, in my humble opinion, highlights those elevations like Justin Tyme’s FSGenesis North America terrain mesh. Version 2 of this product is currently in development, and working diligently to avoid the pit/plateau issues that are usually common where high-res terrain mesh meets FS’s flat airports. For now, you can enjoy Canada in 19m resolution. I’ve been running this mesh for years, and it makes a huge difference in enjoyment, especially in mountainous regions. Canada is an enormous country, landmass-wise. If you live in a more, er, compact nation, it might be hard to imagine just how vast the distances are between its borders. Of course, they don’t call it the Great White North for nothing (joke, people), and a lot of it is pretty rough for humans, both in terrain and climate. If you watch the Olympics on television, you’ll undoubtedly see many sweeping panoramas of natural beauty with towering peaks, braided rivers, and forests that stretch to the horizon. The reality of the default Canada in FS is a little more lackluster than that, due to the coarseness of the data used to represent it. Fortunately, scenery devs have once again stepped in to fill the void. 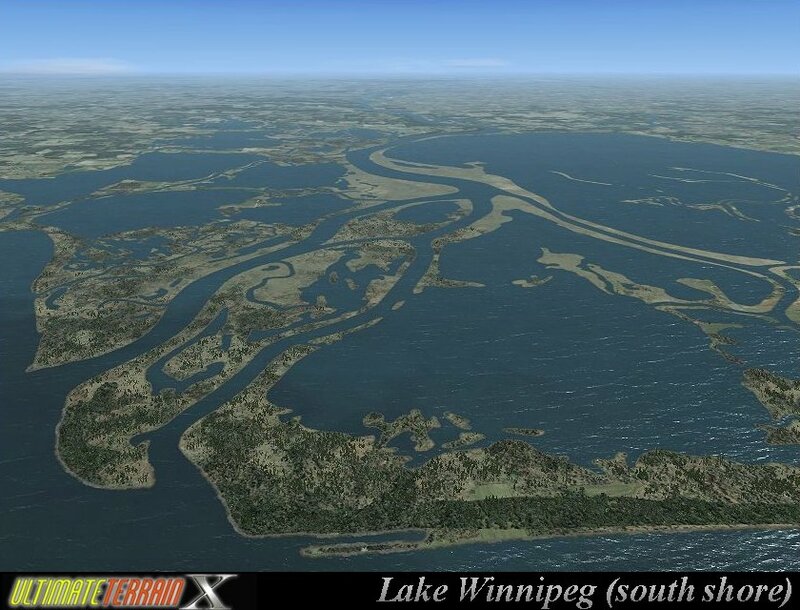 If you’re in an exploratory mood, dress up your FSGenesis Canadian terrain mesh with Scenery Solutions’ Ultimate Terrain Canada, from Flight1. I mentioned Ultimate Alaska last week; well this is its Canadian counterpart, covering everything from the US Border to the Arctic Circle, from Newfoundland to Vancouver Island. It’ll transform Canada into something much more real and intense. The perfect vehicle for seeing Canada? A Canadian-built DeHavilland Beaver, of course! It seems like doing a cross-country trek in the default float Beaver would be an absolute blast. Just don’t forget to pack the back-bacon, eh? Now take off and enjoy the Olympic splendor without having to fight the crowds! 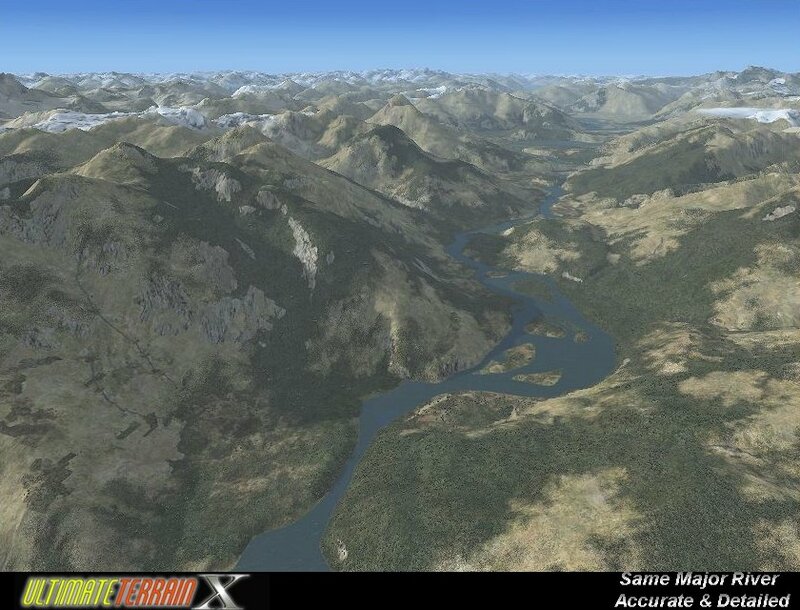 This entry was posted in Fanboy Fridays, Flight Simulator, FSX, FSX Scenery, Orbx PNW, Vancouver Plus, Victoria Plus and tagged Bella Coola, Don Grovestine, Fanboy Friday, FSAddon, FSGenesis, Holger Sandmann, Jon Patch, Olympics, Vancouver, Victoria +. Bookmark the permalink. Although I’m not the type to fly into an area because something is going on in real life there, I must say there is some quality stuff for this area. All the products you mentioned I’ve used or tested in one way or another, and they are all top notch. I use FS Genesis everywhere. Pretty good stuff! How much of BC does PNW cover? Watching the History Channel last night I found out that the two peaks in your Whistler picture are now connected with the longest unsupported span Gondola in the world. Something like 2 miles across and 1500 feet in the air in the middle. Impressive. Watching the Olympic Ceremonies right now and thinking I want Vanc + and PNW ASAP. It is beutiful up there. I too was a bit perturbed by the virtual Haiti relief flights at first; however, I think that those who did these flights probably had the sense to donate to a cause such as Hope for Haiti. At any rate, it looks like there is some very nice scenery for the Vancouver area. I’m downloading Victoria+ now. Looks like FTX PNW will be an improvement even on Vancouver+. Looking forward to many more flights in the region.